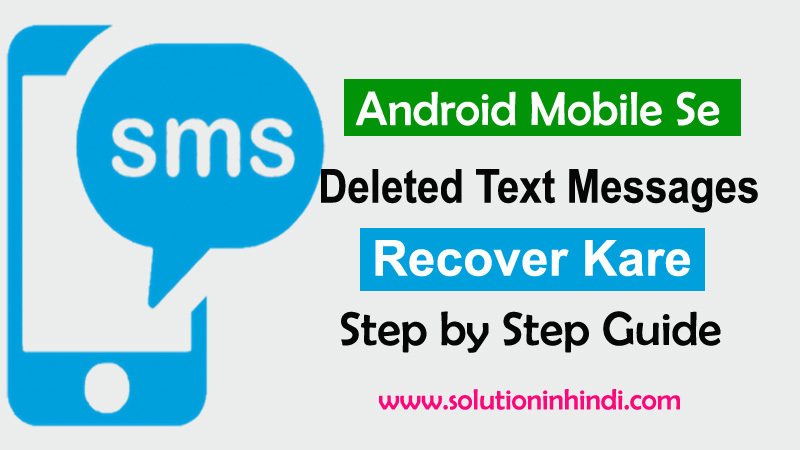 Agar Apke Android Phone Se Koy Bhi Message Galti Se Delete Ho Gaye Ha, Toh Ghabra Ne Ki Koy Baat Nahi Hai, Kyu Ki ‘Android Mobile Se Deleted Text Messages Recover Kaise Kare‘ Is Articles Me Bataye Gaye Steps Ko Agar Aap Carefully Read Karke Apply Karenge, Toh Aapke Deleted Text Message Ko Easily Recover Kar Sakte Hai. Abhi Ke Time Me Smartphone Se Text Messages Delete Hona Common Baat Ho Gaye Ha, Kyu Ki SIM Company Wale Per Day Koy Na Koy Offer Message Karte Rahte Hai, Apne Customer Ke Sath Connected Rahne Ke Liye But 90% Logon Ko Ayse SMS Hateful Hote Hai, Aur Is Type Ke SMS Phone Se Delete Karta Rahta Ha, But Kabhi Kabhi Ham Important Message Ko Bhi Hateful SMS Ke Sath Galti Me Delete Kar Baithte Hai. Basically Ye Mere Sath Bhut Hua Hai So Issi Wajahse Aaj Apko Batane Jaa Raha Hu “How to Recover Deleted Text Messages on Android Phone” Isse Aap Feel Free Me Koy Bhi Text SMS Ko Delete Kar Sakte Ho. Previews Article Me Bataya Tha Ke Memory Card Se Deleted Data Videos Photos Recover Kaise Kare Agar Apko SD Recover Karna Nahi Aata Hai Jake Dekho Bhut Hi Asan Hai, Aur Deleted Photo Ko Recover Kaise Kare – Without PC Isse Bhi Aap Read Kare Ye Sabse Best Method Hai mobile Ya SD Card Se Deleted Images Ko Recover Karne Ke Liye. So Agar Aapke Smartphone Se Messages Ko Coincidently Delete Kar Diye Ho, Ya Aysa Situation Aa Jaye Toh Don’t Warry Aap Bas Is Article Me Bataye Gaye Steps Ko Carefully Follow Karke Easily Deleted Messages Ko Recover Kar Sakte Ho. Toh Chale ‘Delete Message Wapas Kaise Laye‘ Details Se Jante Hai. So Friends, Delete Messages Recover Karna Bhut Hi Aasan Hai, Main Apko Ek Ayse Software Ke Bare Me Bataung Jiske Madad Se Easily Deleted SMS Prapt Kar Payenge. Toh Chale Sabse Pehle Ham Jante Hai Text SMS Ko Recover Karne Ke Liye Kya Requirements Chahiye. Android Phone (Jisse SMS Delete Hua Hai). Dr.Fone – Android Data Recovery Software. Search Form Me “Android Data Recovery Software – dr.fone Toolkit” Par Jake Agar Aap Win Se Recovery Karna Chahte Ho Toh Free Win Version Download Kare, Aur Agar Mac Kar Rahe Ho Toh Free Mac Version Karle. Directly Download Karne Ke Liye Niche Download Button Par Click Kare. Step-1: Sabse Pehle Android Data Recovery Software Ko Apke Laptop/Computer Me Download Kare. Step-2: Successfully Download Ho Gaye Toh Apke PC Me Install Karke Open Kare. 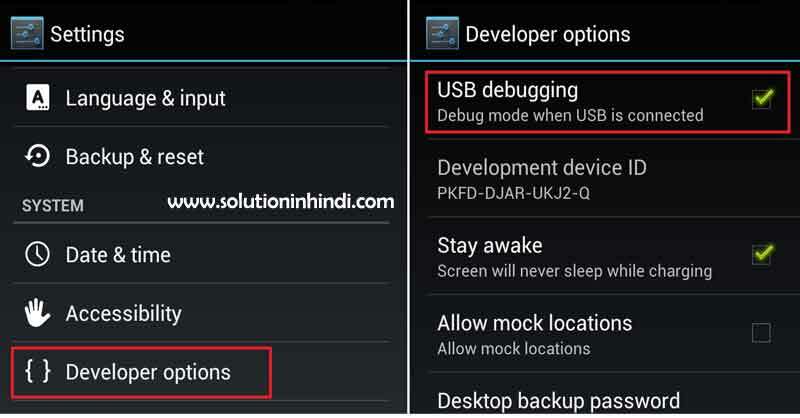 Step-3: Ab Apke Mobile Ke USB Debugging Ko Enable Karna Hai. Uske Liye Aap Mobile Settings Me Enter Kare, Phir Developer Options Par Click Karke USB Debugging Enable Kare. Note: Agar Aap Developer Option Nahi Mil Jaha Hai, Toh Pehle Settings Me Jake Devloper Options Find Karo Agar Nahi Mila Toh Developer Options Kya Hai? Developer Options Kaise Enable Kare, Uski Jankari Yaha Hai Pehle Enable Karo Phir USB Debugging Enable Karo. Aur Developer Option Tips and Tricks Yaha Hai. Step-3: Now Android Mobile Ko PC Ke Sath USB Cable Ke Through Connect Kare. 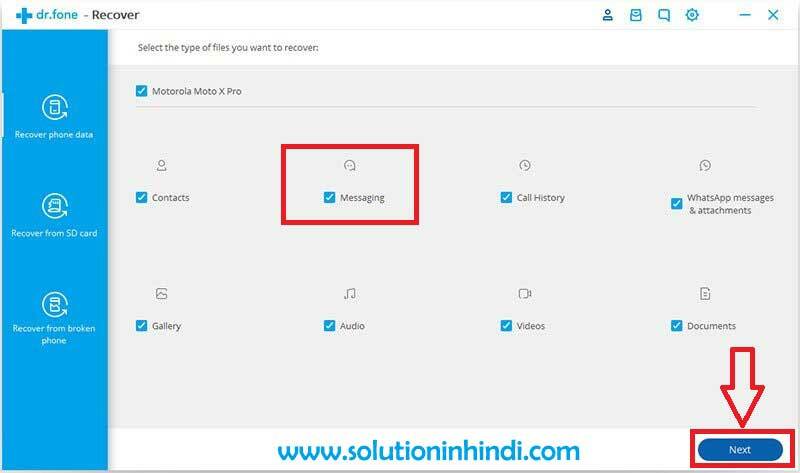 Step-4: Phone Connect Hone Ke Baad Deleted Messages Recover Karne Ke Liye “Message” Option Me Tick Lagaye, Phir Niche Next Ki Button Par Click Kare. Step-5: Ab Apke Samne Data Recovery Page Open Hoke Aayega. 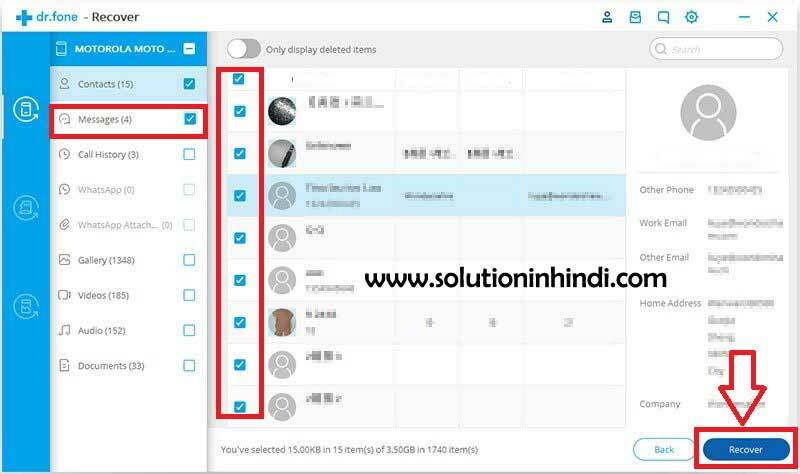 Yaha Apko “Scan for deleted files” Par Click Karke Next Ki Button Par Click Kare. Step-6: Ab Apke Android Phone Analyze And Scan Hona Start Ho Jayega, Kuch Seconds Wait Kare. 100% Scan Complete Hone Tak. Step-7: Scan 100% Complete Ho Gaye Hai Toh Left side me Apko Message Ka Option Mil Jayega, Agar Apko Sirf SMS Recover Karna Hai Toh Message Par (☑) Tick Lagaye. Ab Jis Message Ko Recover Karna Hai Us Par (☑) Tick Laga Ke Niche Recover Par Click Kare. Step-8: Done! Now Aapke Android Phone Se Deleted Text Messages Successfully Recover Ho Gaye Hai. So Friends ‘Mobile Se Deleted Messages Recover Kaise Kare‘ Puri Jankari Apko Details Se Mil Gaye Honge, Agar Apko Kahi Kisi Steps Me Problems Ho toh Feel Free to Ask Question on Comments Box. Aur Apko Ye Post Kaise Laga Hame Jarur Bataye. Friends Computer, Mobile, Earn Money, Social Media, Facebook, YouTube, WhatsApp, Technology News & Internet Ki Puri Jankari Hindi Me Sikhte Rahe Or Dusre Ko Bhi Sikhate Rahe. Hi Friends, I Am Md Badiruddin... Main Ek Professional Indian Blogger Hu! Mujhe Logo Ki Help Karna Bhut Pasand Hai. 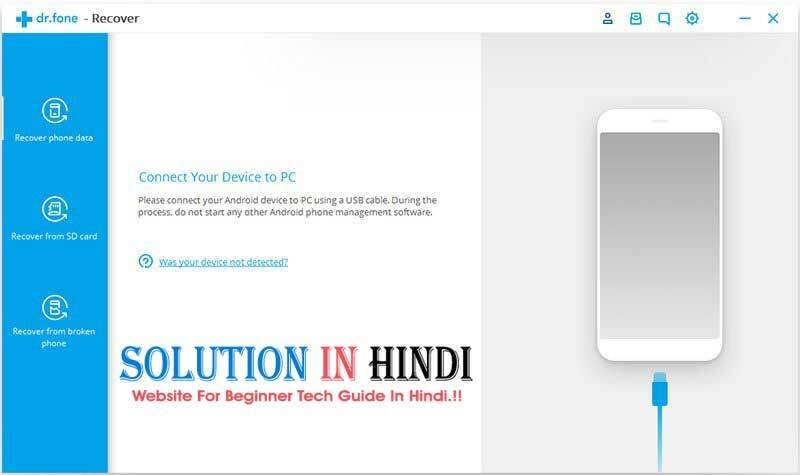 Isliye Solution In Hindi Pe Computer, Mobile, Internet, Social Media, Earn Money, And Other Technology Related Useful Tips And Tricks Ki Puri Jankari Hindi Me Share Karta Hu!